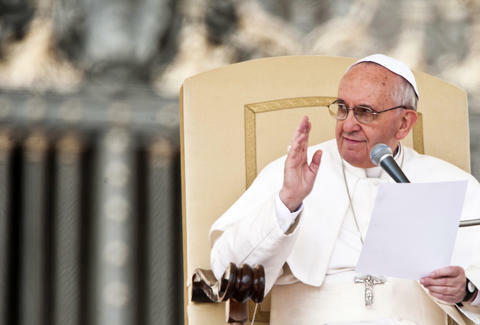 In the latest development in Pope Francis-surprising-everyone news, Pope Francis recently revealed that he has been known to drink wine on occasion. He is, in fact, on record as saying, "Without wine, there's no party," therefore making him the coolest pope since Leo X. His oenophilic comments were made when the leader of the Italian Sommelier Association, Franco Maria Ricci, visited the Vatican and bestowed upon Pope Francis the title of honorary sommelier (just like this adorable Shiba Inu). Speaking about his own drinking habits during the event, the Pope remarked, "I drink a little wine from Italy and other countries from around the world. But just a little," which was apparently met with relief from the delegation of vintners present. After all, it definitely motivates you to know that the leader of the worldwide Catholic Church is paying attention to what you do. And maybe sneaking a sip every now and again. Adam Lapetina is a Food/Drink staff writer for Thrillist, and wonders if the Pope has tried Manischewitz. Read his musings at @adamlapetina.